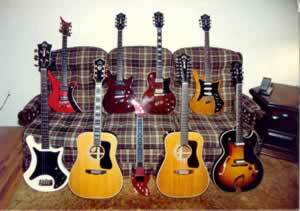 the sound of the phosphor bronze strings then the guitar itself that sold me. As you’ll see, I still have it. again there’s the converted Bogan amp my Dad built for me. 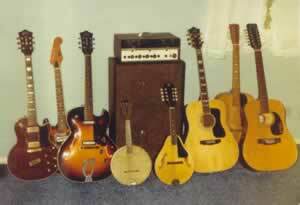 I still have the mandolin-banjo and amp of course. guitar and started shopping for an electric. After he got his first electric he decided he needed a better acoustic. 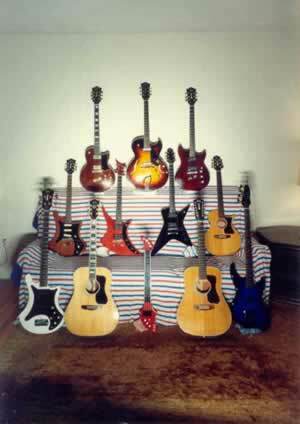 managed to acquire quite a few instruments during this introductory collecting period. (Thanks Franko!). every month. The Guild buying proceeded to escalate. knew so many people around the world had Guilds to sell! collection in the world. Enjoy!